Has two family rooms ( the 3rd floor family room has 2 full futons) and open new kitchen (June 2014) with center island and new floors (2018)with 2 refrigerators. The bedrooms are spacious. With 3 floors, it is ideal to share with another family. It has 6 TV's, extended cable. a patio with 2 tables that seat 12 and with a Weber gas grill with gas hooked up to the house. It has 5 queen beds plus 2 full futons in 3rd floor family room. 4 beach chairs. It has an outdoor shower with hot and cold water. 3rd floor: 2 bedrooms with 1 bath (updated 2014) and open family room in the middle with 2 futons (full size) with cathedral ceilings and skylights plus porch with table and chairs off the bedroom and family room as shown in picture. has NO WALK ON FEES. google map location and see how close to the beach we are. See reviews. People love this house. I am Joanne Armstrong. I am in my 50's. I live 15 min away in Wakefield RI. I work for Amtrak on the Acela high speed trains for 30 years. My passion is houses, renting houses and decorating them and updated them. I own 3 of them that I rent. We built this one in 2000 and I designed the floor prints. I have 2 children. My son is in college and my daughter in high school. Both play soccer. My husband and I have been married 25 years. This house has 3 floors to spread out. Kids love the 3rd floor. It is a very short walk to the beach. The kitchen and 3 baths are recently updated. There are 4 bathrooms. The first floor is very open and the patio has 2 tables to seat 12. All very nice. People love this house. Please see the reviews. 3rd floor is unique as it is an extra floor. Great for kids or people who sleep in. I don’t think this house and location could be beat. It is the perfect place for a getaway with family or friends. There is plenty of space, walkable to the beach and an extremely homey feel. I was instantly relaxed as soon as I opened the door! The landlord takes great care of the property and goes the extra mile to accommodate and make your stay the best it can be. I wouldn’t stay anywhere else on a trip to Narragansett! This house was clean and perfect for a large family or group of friends. Easy walk to the beach and nice neighborhood for walks. Plenty of refrigerator space, nice gas stove and gas grill. Plenty of pillows. Outdoor patio spaces, back yard and 3rd floor with lots of seating. Bright and open on every floor. Highly recommend. 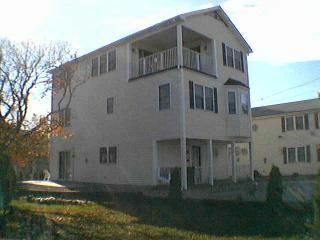 the house was wonderful and it's location excellent - so close to the beach and everything we needed in Narragansett was perfect. we would recommend this house as a perfect getaway. We really liked this house. The layout was perfect for our family of 10. Beautiful Scarborough Beach was a short walk. The only reason I gave 4 stars rather than 5 stars is because I felt it could have been cleaned a little better before we arrived. And there were a couple things in need of repair. Otherwise....nice rental!! This house has everything our family needed, large kitchen well stocked with pots, pans, dishes, etc. There was 14 of us and we did not feel crowded at all. All the bedrooms have double beds so all the adults had their own room. The kids had their own space on the third floor. A short walk to Scarborough Beach is the perfect location. Close to Newport, some of us walked the cliff walk and others enjoyed viewing the mansions. On another day we took the ferry to block island. The older kids enjoyed riding their bikes. The owner was very responsive to any questions we had. I would highly recommend this beach home to anyone with a large family. We just returned from a week at this amazing home at the perfect location. We stay every year in the Point Judith area but this was our first visit at this home. It is incredibly spacious having three floors. The first floor kitchen / dining/ living room area is beautiful and the perfect size for a large family. We loved the beach theme decor also. There is a nice sitting area outside the living room where you can have your coffee in the morning or barbeque at night. On the third floor there is a deck that has views of Scarborough Beach, the moon at night and also you can see the colors of the sunrise. The house sits high above the other houses so you have great views. You walk out the front door and just walk down the street and there you are across the street from Scarborough Beach. It doesn't get any better than that. The owner, Joanne is quick to answer any questions should you have any. I would highly recommend this beach home to anyone who has a large family or just wants a lot of space. We would definitely return. It is a gem.